What is TOSLink Optical Audio? TOSLink is a short name for “Toshiba Link.” It is a standardized optical fiber connection system. It carries a digital audio stream from devices such as game consoles, DVD and CD players, DAT recorders, computers, etc. to an AV receiver that then decodes the audio signal and outputs it through a set of speakers or other audio output device. This kind of cable works by transferring an audio signal through a plastic fiber optic cable. The audio data inputs and outputs have to convert an electrical signal to an optical signal and then back into an electrical signal in order to properly read the data transferred via TOSLink. The peak wavelength for the optical light is 650nm. TOSLink supports many different types of media, they are most commonly seen with Dolby Digital products using rectangular EIAJ/JEITA RC-5720 connectors. Below you can observe the red light that is being used to transfer an audio signal within a fiber optic cable. What is the difference between regular coaxial cables and fiber optic cables? Coaxial cables are an electrical connection versus an optical one. The coaxial cables often use copper to electrically transmit audio signals, which fiber optic cables use light. 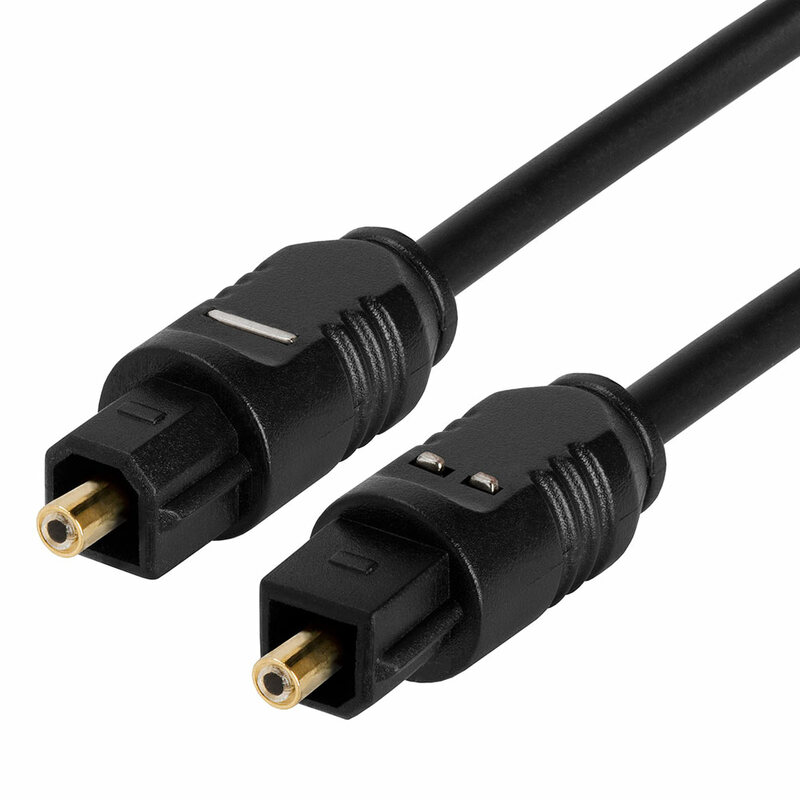 Each end of a coaxial cable uses an RCA jack, which usually stays firmly connected. Coaxial cables can possibly lose signal over long distances. Another major difference between coaxial cables and fiber optic cables is that coaxial cables are susceptible to radio frequency interference (RFI) and electro-magnetic interference (EMI). Both RFI and EMI can create a “humming” in the sound if there are any preexisting problems with the system or the ground loop. That is because the humming transfers between the different components in a coaxial system. Because fiber optic cables use light, RFI and EMI aren’t problems that can be encountered. Optical cables however, are more fragile than coaxial cables. One pinch or bend in the wire and the entire signal can be ruined. The connectors in a fiber optic cable must be inserted correctly and with extreme care. Is it better to use a coaxial cable or a fiber optic cable? The answer to this question depends on the person and the system that the cables are being used for. It wouldn’t be correct to say that coaxial audio technology is obsolete, however, fiber optics are more modern than coaxial. Though the sound quality in both is very good – there may be subtle differences. However, these differences are very subtle and usually aren’t that noticeable unless you’re using a high-end system. 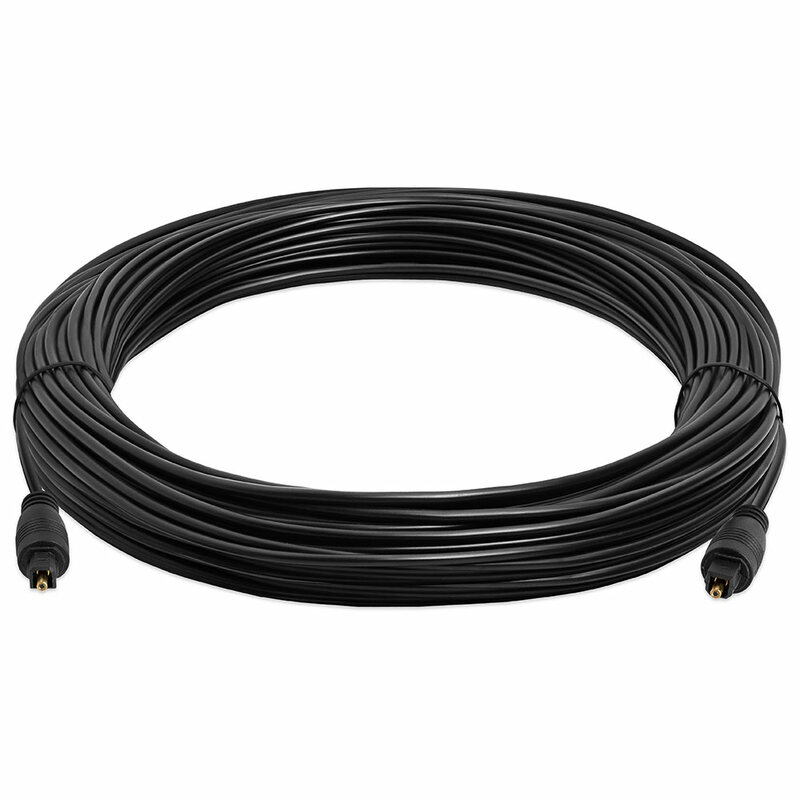 Usually for the typical home theater system, coaxial cables will suffice, but if you want to reduce on RFI and EMI, then an optical cable would be the way to go. Another thing to consider is the price difference between them. Optical cables are slightly more expensive, but neither is particularly pricy. Also, another thing to think about is the distance that you’re passing the wire across. Unlike many different types of cables, particularly multimedia cables (HDMI, etc. ), audio cables do not carry an AWG gauge. In fact, they do not have a gauge at all. The difference between different cables is only in the length of them. If you are transmitting the signal over a longer distance, then optical cables could be preferable because the electrical impulses emitted from coaxial cables start to lose strength over a distance, and that therefore reduces the audio quality. Like any other type of cable, there are problems that can come up when using TOSLink technology. Perhaps the biggest problem with this type of cable is its fragility. You have to be particularly careful when setting it up to make sure that there are no kinks, bends, or pressure on the cable. Therefore, you can’t put it in a walking area or anywhere that it may be touched with a reasonable amount of force. This can negatively impact the signal and possibly damage the cord because it interferes with the optical connection. Another issue with fiber optic cables is that they have to be inserted correctly so that connector is snug and tight into the input. There is only one way to insert the optical cable, and doing it wrong can damage the cable. Also, optical cables require additional processing steps in converting current to light and light to current. These steps can possible cause errors. Lastly, it is very important that optical cables are kept straight. This can be a challenge when you’re running it across such a long distance. If any of these problems can be avoided, then the audio signal will be crystal clear. TOSLink is commonly used in many home theater systems. It was first used in CD players, and can now be used in many different DVD players and game consoles to connect a digital audio stream to Dolby Digital/DTS decoders. There is technology similar to TOSLink that is very common in the music industry. Any device can really use a fiber optic cable versus a coaxial one as long as it has a “digital optical socket” for it to be connected to. Depending on how you plan on using the cable, a decision should be made whether to use an optical or a coaxial cable for your theater system. There are several factors to be taken into consideration. Firstly, you should consider the nature of the system. If you think that you’ll have to run a cord around walls, in obtuse direction, but not over a ridiculously long distance, than a coaxial cable should suffice just fine. However, once you hit long distances, optical cables would be preferable. But you have to remember to keep it in a straight line, otherwise there could be disruptions in the audio quality and the cable could possibly be damaged. Optical cables are also good for shorter distances as well, and if you think that an optical cable can suit your needs within aclose vicinity, then perhaps it is the product for you.